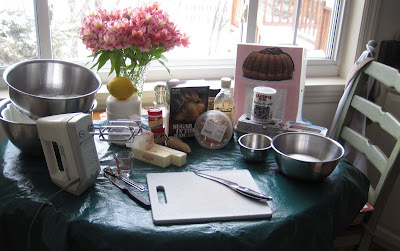 It's time again - time for me to bake a cake all by myself! I used to bake by myself all the time, and cook all by myself, but since the start of life in the wheelchair, I find I need a lot more help. My solo kitchen efforts are definitely 'easy' dishes and usually, SP helps me with a bit of prep before he heads out in the morning. The exception is SP's birthday cake. He does not get to help at all. It's supposed to be a surprise. Step 1, as soon as he leaves for work, gather all the ingredients: And there's some not in that photo -- like the strawberries -- and the flour/sugar were already measured and in the metal bowls. Our first year living together, I made him a carrot cake with cream cheese icing. In addition to peeling and grating all the carrots, the recipe used 4-5 spices. It took me a long time to gather/measure/make and I made quite the mess that I then had to clean up myself! The ingredients were staples in our pantry plus the carrots (I simply told him to add carrots to the grocery list because I wanted cooked carrots for the dinner veggie) and the cream cheese (of which we had lots leftover from holiday baking and then a Super Bowl dip). It was a total surprise when he got home from work that evening and saw his cake on the table. Last year was the lemon cake with lemon curd and lemon icing fiasco. 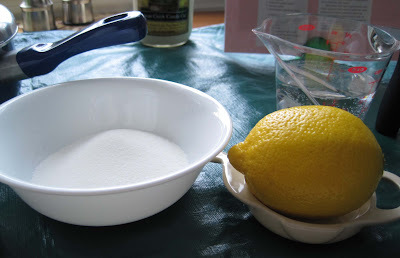 That was an easy surprise, too, because we always have lemons and the other ingredients were pantry staples. This year, it was tough to surprise him. I kept wanting to make cake recipes with 'special' ingredients. I kind of think a birthday cake should be a layer cake so my first choice was the Chocolate Stout Cake. But I couldn't figure out how to sneakily get the chocolate stout. Since I no longer drive, I couldn't just go buy it myself. I don't drink beer, so I couldn't be all, hey, I want to try some chocolate stout this week, can you grab some at the store? I already know that the chocolate stout 6 packs sold at Market District are sold cold, so it would have to stay refrigerated (the recipe uses 1 bottle, so a whole case seems extreme, if they even sell chocolate stout by the case). A 6 pack of chocolate stout in the refrigerator would be noticed, no matter how much I tried to pile stuff in front of it! I could ask a friend to buy it and keep it for me, but they probably couldn't bring it over on the day of baking after SP left for work (he can set his own hours and usually goes in late enough to avoid the worst of rush hour) but in time for me to bake before SP got home. So I abandoned that idea and we made the Chocolate Stout Cake for the Super Bowl. 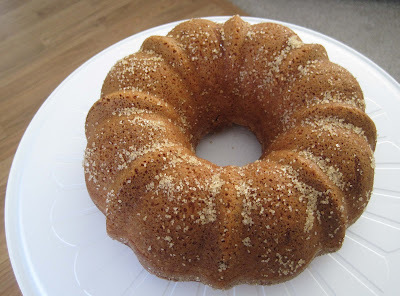 I decided to bake Double Ginger Sour Cream Bundt Cake with Ginger Infused Strawberries. It's from the April 2009 issue of Bon Appetit. 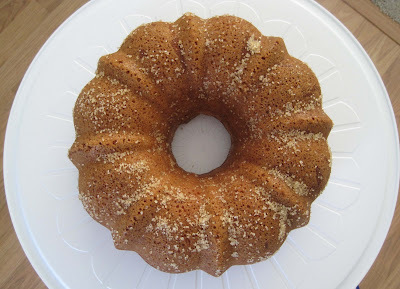 It's a bundt cake, which somehow seems un-birthday-cake like to me, but a bundt cake would save me from layers falling off one another and SP really likes ginger. Of course I needed sour cream, fresh ginger, and strawberries. Not staples in our house. I couldn't figure out how to add them to the grocery list but make it look like they were dinner ingredients. So I just put them on the list. And when he asked why, I said, oh, none of your business. Like that didn't send up any red flags. 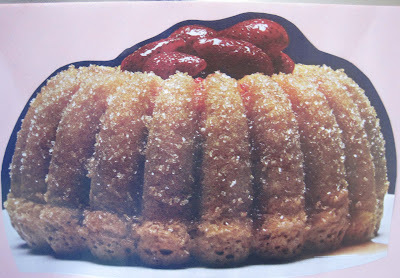 I was happy it used a 1/2 cup of raw sugar/demerra sugar/turbinado sugar since we bought a huge box at Christmas time for just one recipe - and that recipe called for maybe 2 tablespoons of the sugar! 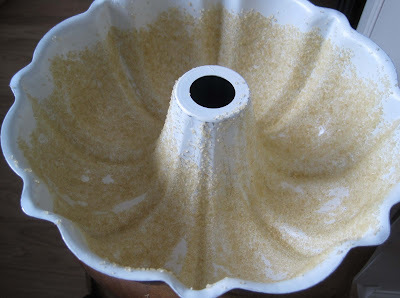 The raw sugar is used in place of flour for 'greasing & flouring' the bundt pan. 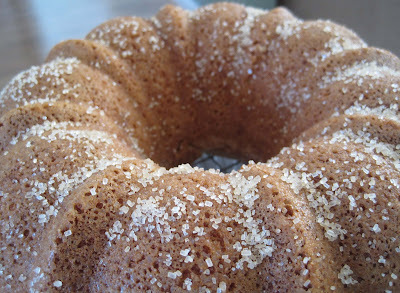 I thought I did a pretty good job coating the pan with the sugar. 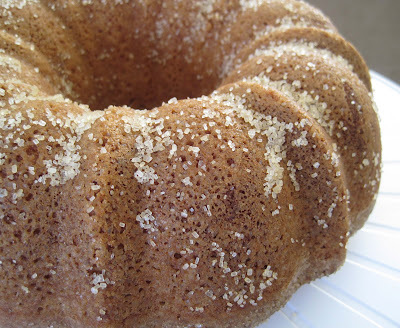 The most annoying part of this cake was chopping the crystallized ginger. 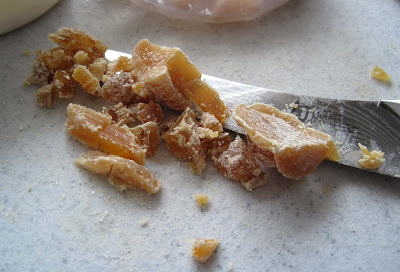 This was my first time actually chopping crystallized ginger. 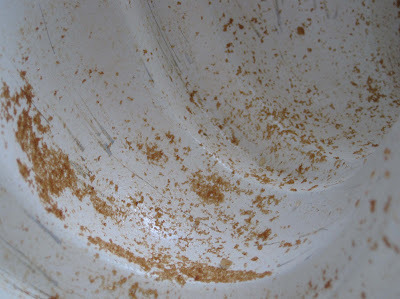 Usually, SP chops it when we make the Triple Ginger Cookies. 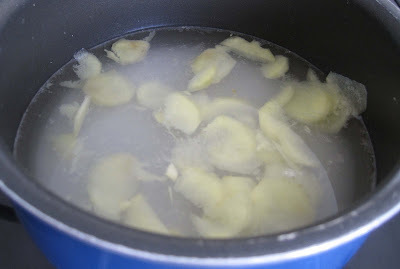 I think I will leave all future crystallized ginger chopping to him. Did I mention it was the most annoying part of this cake?! Somehow, the stuff manages to be softish yet still difficult to cut through. It's sticky. It's more fibrous-y than I expected. It took me a long time, I agonized over exactly how small to chop it, and I got frustrated with the stickiness and chopping difficulty. Happily, making the cake was pretty straight forward, so there's no photos of that. The hardest part, aside from chopping the crystallized ginger, is separating an egg, but I've become pretty good at that. After I put the cake in the oven to bake, I made the ginger syrup. 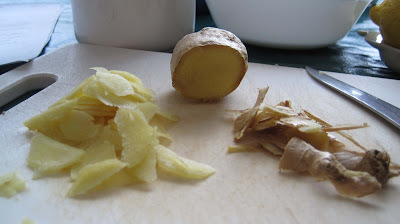 I had fun using a very sharp knife to very thinly slice the fresh ginger. It's just like when we make simple syrup for iced tea, only ginger infused and the ratio of sugar to water wasn't 1:1. I loaded all my messy bowls and utensils into the dishwasher while the cake finished baking and the syrup boiled. I don't usually toss measuring cups in the dishwasher, but in a sign of just how blah I've been feeling, EVERYTHING went in the dishwasher. 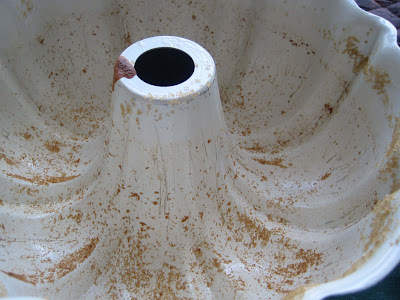 Even the bowls that just had flour or sugar in them. Only the extra special/extra sharp knife got washed by hand. 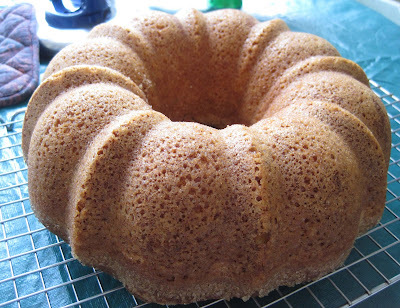 It's always a happy cake day when the cake easily slides out of the bundt pan: Look - no sugar! And very little cake residue. But where were the pretty sugar crystals that were supposed to sparkle on my cake? It was bald! It's supposed to look like this: I was annoyed. Was I destined to have another birthday cake fail? I wasn't super surprised - I had been wondering how exactly the sugar would not melt and not be absorbed into the cake. The sugar was between the moist/melty smeared butter and the moist, wet batter. So I threw caution to the wind. 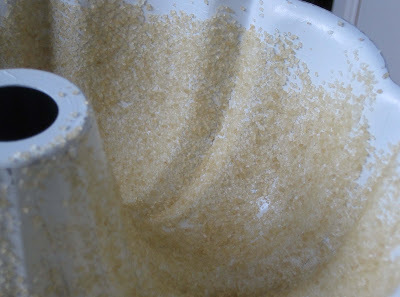 I grabbed the box of raw sugar, poured some into my hand, and started trying to press it onto the cake. It worked OK. I got a lot of sugar all over myself and the kitchen, which was annoying. But at least the cake looked kind of sparkly. Of course my preoccupation with having a sparkly cake meant I neglected the boiling of the syrup and 'reduce to scant 1 cup' turned into 'reduced to scant 2/3 cup.' Whoops. 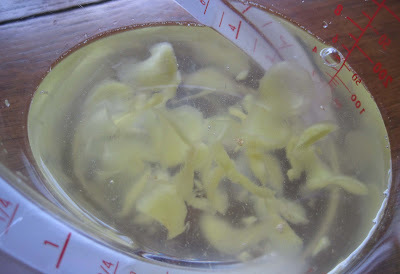 For this syrup, the ginger slices stay in the syrup while it cools. 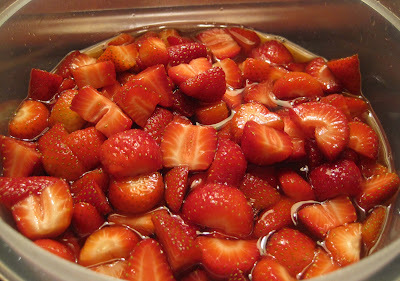 They are not strained out until you're ready to pour the syrup onto the strawberries. 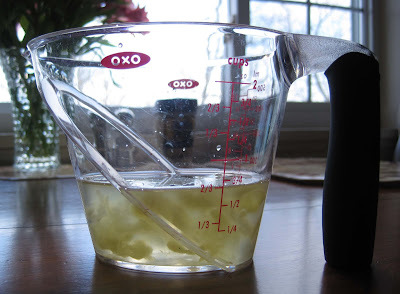 After the ginger slices were strained out, I was left with a 'scant 1/2 cup' of syrup. Oops. So I used a bit over 4 cups sliced strawberries instead of 8 cups. I also quartered the berries instead of halving them. I don't have a huge mouth so I don't like trying to fit large chunks of food in it! It's much more manageable to me if the berry is quartered. SP was surprised when he got home. For one thing, he didn't know which day I was going to bake. 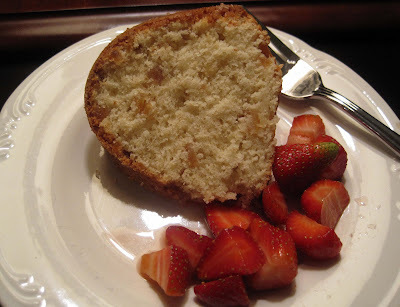 Plus, he didn't know the exact cake I was going to make, just that it somehow involved fresh ginger & strawberries. The strawberries really complement the cake. I would not make the cake and omit the strawberries. The cake is deliciously gingery. 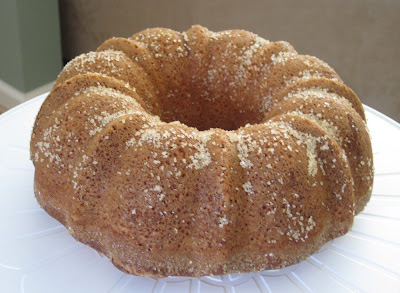 If you don't like ginger, you won't like this cake! 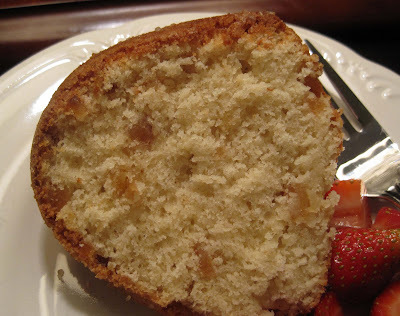 The cake crust was quite nice and the interior was moist. We both really liked it. I'm happy that this year, his birthday cake looked as good as it tasted. I definitely wanted to redeem myself after last year! And I think I succeeded -- SP had 2 helpings of dessert last night! I again launch my petition for you two to adopt me. Yes, I am a grown woman. But I will clean and help out around the house, and all I ask for is a regular spot at your table and perhaps a special cake on my birthday. Pretty please? 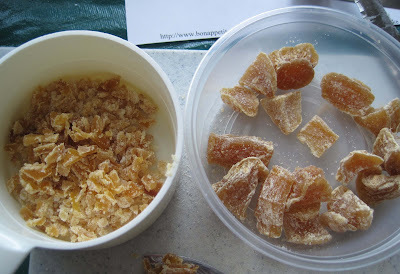 With crystallized ginger and sugar on top? Looks wonderful! Congratulations on a very successful birthday cake! That looks amazing. Your story is so lighthearted too! Literally had me laughing at certain points! Wow - yummy! And I loved the story too! Wow, what a yammy cake. i love that very much. Good post thanks for sharing here.